The brave souls of the Rebel Alliance. All your favorite characters in one paper giclee print! Limited edition of just 95 hand numbered pieces. Based on Star Wars, it measures 22-inches tall x 8 1/2-inches wide. 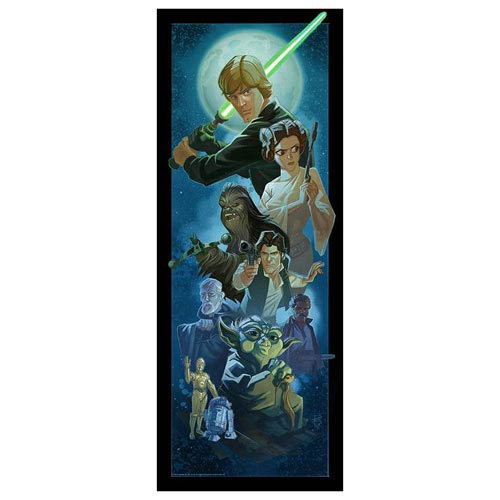 This unframed Star Wars Rebel Alliance Paper Giclee Print features a montage image of Luke Skywalker, Princess Leia Organa, Chewbacca, Han Solo, Obi-Wan Kenobi, Lando Calrissian, Jedi Master Yoda, C-3PO, and R2-D2. Against a beautiful twilight background with a large planet casting a blue glow, this beautiful work of art belongs on your wall! The limited edition of just 95 hand numbered pieces presents original artwork by Patrick Schoenmaker, printed on paper measuring 22-inches tall x 8 1/2-inches wide. It includes a certificate of authenticity.